You are here: Home / News / Check out an interview with Rob Thomas on Forbes.com! Check out an interview with Rob Thomas on Forbes.com! Left and right, it seems like there are musicians making stands with the LGBTQ community, be it with a statement, an empowering anthem, or by refusing to perform somewhere. Recently, a handful of stars such as Bruce Springsteen and Pearl Jam have all canceled shows over legislation they see as reprehensible, potentially losing out on hundreds of thousands or even millions in ticket sales and merchandise revenue. Last week, the Trevor Project, an organization that operates a suicide hotline specifically for LGBTQ youth, held its annual spring event. 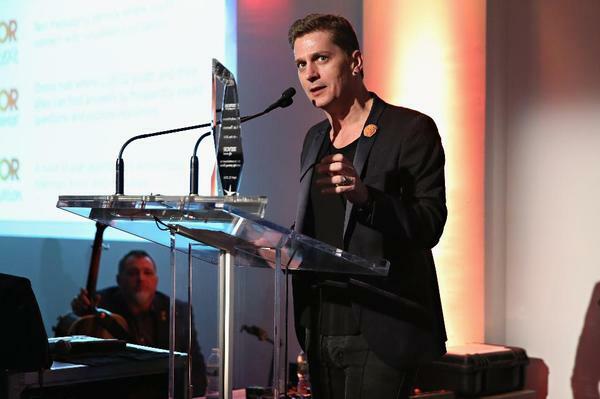 That night, the nonprofit gave a very special ally award to Matchbox 20 frontman and solo artist Rob Thomas, who is not gay himself. It was a very purposeful choice, and one that sends a message that straight allies are incredibly important, especially in the music industry. Thomas is also a musician that has a platform on which to speak, thanks to his many successes in the industry. As the leader of his band, Thomas has penned or co-penned eleven top 40 hits, and that number expands to fourteen when his solo work is added in. He has a sizable collection of gold and platinum albums, and three Grammys (out of nine nominations). He has earned the position he is in, and he is able and willing to use it now. I sat down with Rob before he accepted his award and performed for the crowd of several hundred people, and he spoke at length about why he was here to claim a prize simply because he stands for what seems like common sense, and we talked about whether he would cancel shows based on a state or city’s discriminatory laws.